Here are some things I like: Having a clean house. Things that serve lots of purposes. Youtube videos of cute kittens doing cute things. Green cleaning solutions. Salad dressing. All these things have one thing in common: Vinegar (well, except the kittens). Like baking soda, vinegar is an everyday household item that can be used for a million purposes around the house (and has been, by generations). Vinegar is amazing- it's environmentally-friendly, effective at cleaning a million things, non-toxic, and inexpensive. And it makes coleslaw taste delicious! For most of these uses, your best bet is to use the plain old distilled white variety of vinegar, since it's colorless, widely available, and usually the cheapest. Buy it by the gallon, and you can clear out most of those nasty toxic cleaners from under your sink. And, if you're concerned about the smell, I promise it will disappear once the vinegar dries. Which is more than I can say for some of those perfume-y chemicals. 1.Kill weeds and grass growing where you don't want 'em- on your sidewalk or poking up through cracks in your driveway, for example. Simply spray full-strength vinegar on the weeds, and watch in amazement as they wither up and die (a few days later, probably). 2. Keep flowers fresher longer- add two tablespoons of vinegar (and two of sugar) to the water in the vase. The acid will prevent the submerged stems from rotting. 3. Clean the toilet bowl by pouring a couple cups of straight vinegar and letting it sit for 30 minutes. Then scrub the bowl with your toilet brush- it works just as well as those gross blue gels, but won't slowly poison your toilet-drinking dog. 5. Because it is so acidic, vinegar works as a solvent on most glues. To remove stubborn stickers, or old caked-on wall-paper paste, apply vinegar and let it soak in for a few minutes. The glue should easily peel right off, like a miracle. 6. If you get stung by a bee or bitten by a mosquito or spider, apply vinegar to the wound to relieve the pain or itching. Ours is not to question why (and, also, I don't know why), but it really works to soothe them. 7. Do your tools have rust on them? Well, you should take better care of them. But, in the meantime, vinegar can remove rust from tools, as well as old bolts and knobs. Just soak the item in vinegar overnight, and the acid will go to work on the corrosion. 8. I bet the insode of your microwave has seen better days- I don't even have one, but back when it did, I was constantly battling the caked-on nastiness on the inside. To easily clean your microwave, put a bowl with 1/2 cup of vinegar and 1 cup water in, and bring to a boil. All the grossness will be loosened up and any food odors will be gonzo. 9. Who stocks buttermilk in the fridge? Instead, when a recipe calls for it, MAKE buttermilk by adding a tablespoon of vinegar to a cup of regular milk. Give it five minutes to thicken, and voila! (I'm serious- I do this all the time). 11. Once, I bought a stack of gorgeous preppy-nautical navy-and-white striped beach towels. Before I used them, I threw them in the wash and ended up with sad, dirty-looking, navy-and-light-blue striped towels. To keep bright colors from running in the wash. soak the items in vinegar for 10 minutes before you throw them in the washer. Also, throw a 1/2 cup of pure vinegar in with your loads of laundry during the rinse cycle to brighten fabric colors. 12. There's nothing like a smelly kitchen sink drain to take the joy out of cooking. To combat that stench, pour a cup of vinegar down there every couple weeks or so. If you have a garbage disposal, you can make vinegar ice cubes and grind them up down there- it really works. Who knew something so sour could be so sweet? Like, cute-kitten sweet. Vinegar and water is also the BEST solution to clean windows! I bought a gallon of white vinegar at the dollar store a few weeks ago. Can't beat that price. PS - Your blog is awesome! What amazing tips! Thank you! 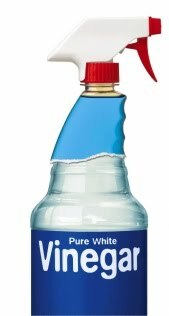 @Anonymous- I always thought you would have to pry the Windex from my cold, dead hands, but you are right- vinegar works just as well- I combine 2 cups of water with 1/4 cup of vinegar in a spray bottle, and then add just a dab of liquid soap). @Ship- it's hard to buy water for that price these days! My gosh, what great tips. I knew about the toilet bowl cleaning power of vinegar, but that's about it. Why didn't I find this post (and your blog) months ago?? Thanks. @MissMarried- I know, where have I been all your life? Thanks for finding me!